I had been ridding my bike for about a year when I just quit because I just never felt comfortable and did not seem to be improving. During the year I was not riding I turned to other forms of exercise. I saw that a friend had done a triathlon. I thought I could do that. So I inquired at my local tri/running shop (Front Running Sports) about how and where to start with the training. I explained to them my troubles with my bike and my desire to train for a Half Ironman triathlon. They told me about Coach Kamel and how a proper bike fit may be the answer to my biking problems. Once I initiated contact with Coach Kamel he promptly got back to me and set up an appointment for a bike fit. Coach Kamel took a lot of time getting measurements. He measured, he video taped, he re-measured. His attention to detail and his knowledge about my bike and my fit were apparent throughout the session. 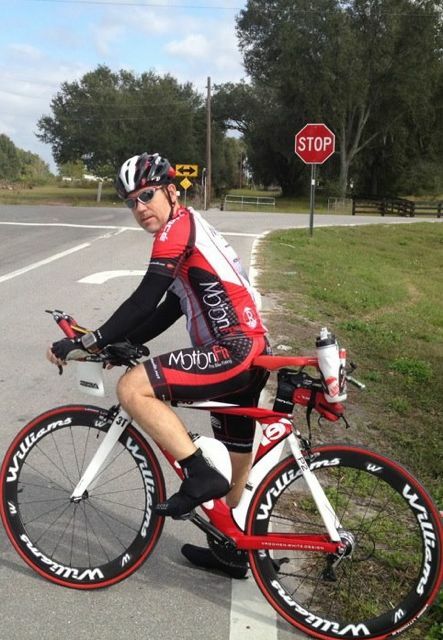 He freely shared knowledge regarding cycling and triathlon training. The benefits of my bike fit were noticed immediately in the form of more comfort and the ability to ride longer without back or neck pain. Over a short period of time I was able to increase my miles per hour pace and I credit my proper bike fit for these improvements. At the time of my bike fit I discussed training with Coach Kamel. Unfortunately I was not able to start training with Coach Kamel at that time. I still had a planned half Ironman scheduled went on with my training. I was able to compete and complete the half Ironman but felt I could do better so I contacted Coach Kamel to help. From the very first training session it was apparent that Coach Kamel was organized and goal oriented each of the work out had a purpose. There were no wasted workouts. My fitness improved steadily and by the time I had completed 5 months of training with Coach Kameel I was a totally different athlete I was leaner, faster and more confident in my ability to compete. The training not only made me fitter it gave me the confidence I needed to improve. I continue to train with Coach Kamel and have a full schedule of races planned for this season with my goal of becoming an Ironman in Arizona. I have no doubt that Coach Kamel will provide me with a training plan that will have me ready to perform at the best of my ability in Arizona.